Our Journey to the East: PA! PA! PA! I am SOOOOO excited! I got the call from my agency while I was sitting in the Veterinary's office....we have PA!! I am proud to introduce Ashlyn Rae Yu You Sloan!! 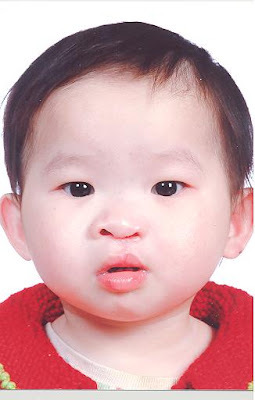 She is in foster care, but was in the First SWI of YuLin (orphanage) for the first year of her life. She was found the day she was born. She has a repaired cleft lip/ cleft palate. Her middle name will be Rae (my husband's mom's middle name) and Yu You. This way she can keep her Chinese name too. We are so excited...I can't stop doing the happy dance!! I am so happy for you - she is beautiful!!! I am SOOOOOOOOOOOO excited to see her beautiful face on the blog! She is so loved already and doesn't even know it yet:) You guys are awesome! YEA for PA!!!!! She's beautiful!! I'm so happy for you! Wow...she looks so sweet..like I just want to squeeze that cute little face of hers. What a beautiful little girl, I can't wit to see her in your arms!! We have some online friends that might have adopted from the same orphanage. http://lovinglydia.typepad.com/loving_lydia/ Her last name was also Hua, and Im fairly certain that the surrounding area looks the same. And as a previous poster stated-She "has the same eyes". Lydia's mother has researched a lot about the minority that's most prevalent in that area, so she would be a wealth of information for you, if they are from the same area.